With the motto of “Assistance Without Delay” and a creed of “100% for Charity”, the Old Newsboys are driven by a straight-forward, yet important mission: “No Child Shall Miss School for Lack of Shoes or Coat”. Our goal has been the same since our founding in 1929: “Immediate Emergency Service When a School Administrator, Police Officer, Fire Official, or Neighbor Reports a Child in Need”. The Old Newsboys is not a substitute for public welfare or other various social agencies, and does not undertake continuing clients. Instead, it functions without administrative delay to afford speedy, temporary service. 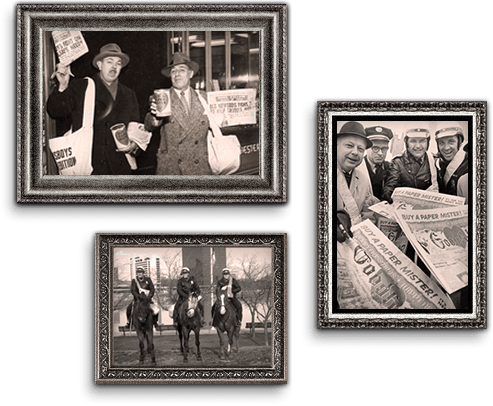 Watch a short video about The Toledo Old Newsboys Goodfellow Association. Distribution of new clothing and shoes to needy children via vouchers distributed by school administrators, policemen, firemen, and neighbors. Donations to other local charitable organizations that also provide assistance to needy kids. Delivery of food baskets to needy families, throughout the year and especially during holiday seasons. Awarding 8 college scholarships each year to high school seniors who would otherwise not have an opportunity to further their education. Hundreds of thousands of dollars are spent each year for these worthy programs. Distribution is made without regard to race or creed. The only criteria is being in need. Visit our Facebook page to learn the latest about our team at work. The Old Newsboys is an organization of over 600 active and life members. We have been devoted to helping needy kids in the Toledo area since 1929. Our members come from all walks of life. Our common bond of fellowship is compassion for children suffering from poverty and neglect. You don’t have to be old, have had newspaper route, or be a boy to join us. “Newsies” raise 100% of their own funds by hawking an annual Charity Edition Newspaper each December. We sell our newspapers on area street corners and in local businesses, banks, malls, and any place that will have us. 100% of what we collect goes to help local kids. We are very proud of our history, and invite you to help us continue our work, by donating both your time and your money.